You can see the results of the poll in the gallery. I’ve been storing coffee in my freezer for over three years, simply out of necessity. Since I regularly have more coffee than I can drink, and can’t bear to see it go to waste, I have to do something with it. While I do give some away, I feel bad about that. After all, someone’s given me that coffee, presumably because they wanted me to have it, so giving it away feels ungrateful. (As an aside, I was in Miami in 2017 at the wonderful Panther Coffee. While the roaster was busily pulling out bags of coffee for me to try, I casually asked if it was okay to give some of it to friends since I’d never manage to get through it all myself. No problem, he said, then promptly gave me several extra bags for my friends! Not the outcome I’d been hoping for…). So, given an overabundance of coffee (admittedly, a nice problem to have), my only real option is to store it in the freezer. My technique’s simple. Any coffee I know I’m not going to use or pass on, I put, unopened, into the freezer, sometimes putting the bag into an airtight container. Then, when I’m short on coffee, I bring the bag out, defrost it (ideally overnight, but a few hours will do) then open the bag and use it normally. This defrosting routine is important, since moisture is a big killer of freshness in coffee. Immediately opening the bag means that the (frozen) beans come into contact with the moist (warm) air, the moisture condensing onto the beans. For that reason, once you’ve opened the bag, you shouldn’t refreeze it and you should most definitely not take a bag from the freezer, open it, take out a small amount of coffee, then put the bag back into the freezer. So that’s my technique. But does it work? What follows are my subjective (and very unscientific) findings from three years of keeping coffee in the freezer, where my experience has been overwhelmingly positive. The coffee I regularly pull out of my freezer tastes pretty damn good. Here’s two two recent examples. Just before my most recent trip to China, I pulled a bag of Kenya AA from Grindsmith out of my freezer which had been there since November. I’ve been using it as a pour-over, with my collapsible filter and my brand-new portable pouring kettle and, I have to say, it’s been gorgeous. Regular readers know that I usually struggle to pick out specific flavours, but this was bursting with blackcurrant. A coffee, let me remind you, that had been stored in the freezer for over three months. 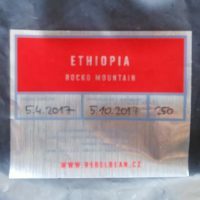 Going back even further, in February, I pulled out an Ethiopian Rocko Mountain from Czech roaster, Rebel Bean, which I bought at the 2017 London Coffee Festival, so that had been in my freezer for almost two years. And it was divine. A really delicate, floral coffee, easily one of the best I’ve had in the last six months. I could go on, but you get the point. As I say, this is very unscientific. I don’t know how the coffee would have tasted had I used it immediately, or just stored the beans, unopened, at the back of my cupboard. Who can say? The scientist in me says that I should get three bags of each coffee, trying one immediately, storing one in my cupboard, and putting the third in my freezer. This way, when it comes time to try the frozen one, I can compare it directly with the unfrozen bag in my cupboard and, by reading my detailed notes (like that’s ever going to happen! ), I can compare them both to the coffee I drank when it was fresh. However, this seems rather wasteful to me, and since the whole point of the exercise in the first place was to stop wasting coffee, I can’t see me doing it any time soon. So, there you have it. As far as I can tell, storing coffee in the freezer (in the manner I’ve described) does no harm. I’m not recommending that you immediately start buying kilos of coffee to put in the freezer, but if you’ve got a bag that you know you’re not going to use in the next month or so, just pop it in. Trust me, it works. Interesting post. I admit I was 1 of the 99 in the poll… BUT, have you seen this article? (It’s open access so everyone can read it). They conclude (among other things) that for long term storage, liquid nitrogen/dry ice may be a good idea. Keep going with the freezer! I had indeed seen the article and did consider citing it, but felt it wasn’t really address the same question and was more applicable to the coffee shop than the home environment. Thanks for bringing up though. If I had more time on my hands (and thousands of small containers) maybe I would pre-weigh all my shots and store them in the freezer, bringing them out just before grinding. On the other hand, the EK43 grinds at 20g per second, whereas I grind at about 20g per minute, so I do wonder how much moisture the coffee would attract in the process! !